The World Health Organization’s definition of obesity is having a BMI greater than or equal to 30. (BMI greater than or equal to 25 is considered overweight). But it's also important to understand that there's more to your overall health than the number you see when you step on the scale. That being said, if you're trying to lose weight, it's incredibly beneficial to keep your cardiac health in mind with some heart-healthy dietary choices. Here are just a few of the best foods to incorporate into your diet that can keep your heart healthy. "Whole grains are good sources of fiber and other nutrients that play a role in regulating blood pressure and heart health. You can increase the amount of whole grains in a heart-healthy diet by making simple substitutions for refined grain products. Or be adventuresome and try a new whole grain, such as whole-grain farro, quinoa or barley," says the Mayo Clinic. Fresh fruits and vegetables are an important part of nearly any diet, but it's important to consume them properly for a heart disease diet in particular. As opposed to making dishes that include rich and creamy ingredients, try to roast veggies like asparagus and broccoli to get the same flavor boost without the fat. In the same realm, try to avoid buying canned veggies that are high in sodium -- opt for fresh as often as possible. Finally, try to incorporate more lean proteins into your diet, like chicken breast. This can be substituted for any number of unhealthy proteins, like fried meats, hot dogs, or bacon. Legumes, low-fat dairy products, and eggs are also heart-healthy sources of protein. 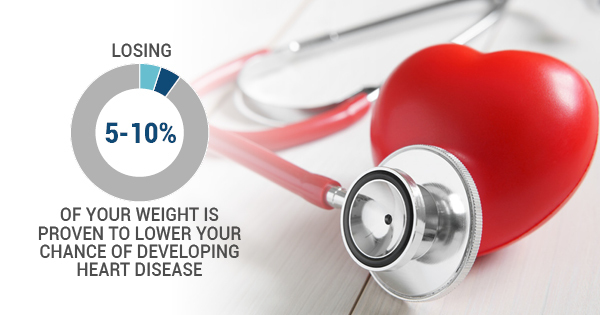 Ultimately, losing 5% to 10% of your weight is proven to lower your chance of developing heart disease, and it's all about eating better by making small but meaningful changes in your diet and overall lifestyle. For more information about the best foods for a heart disease diet, contact 20/20 LifeStyles.